Of course you are! It’s other people who are the problem, right? Sometimes trying to communicate with them is frustrating, drains your energy, and feels nearly impossible. 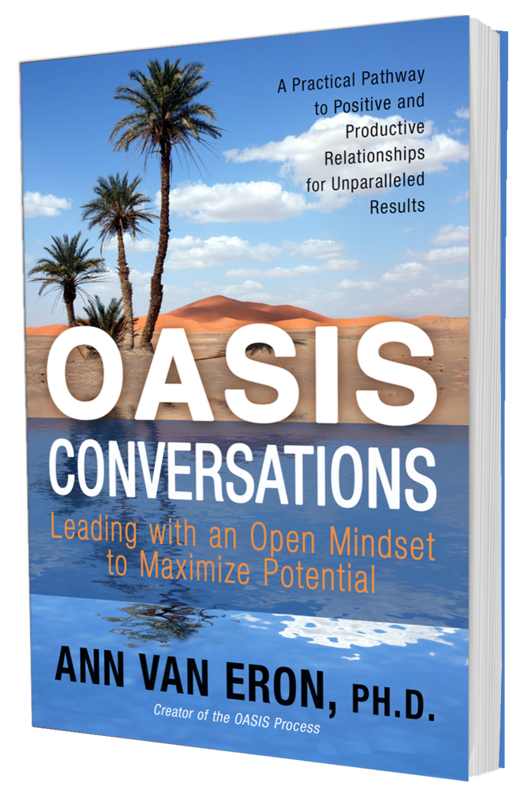 What if you could turn the desert of miscommunication that exists into an oasis where you can have refreshing conversations, that allow you both to understand where the other is coming from so you can develop empathy, insight and reach mutually beneficial agreements? 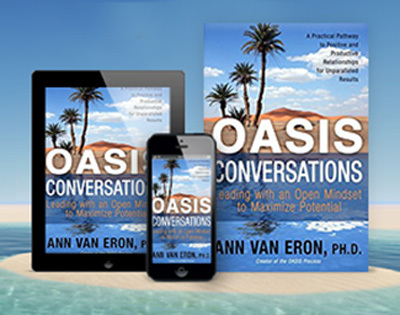 In OASIS™ Conversations, Ann Van Eron draws on scientific brain research and her years of coaching experience to teach readers a process to achieving mind-opening connections with others. Find out why global organizations, Fortune 500 corporations, and even families are benefiting from the OASIS Conversation process. Learn how to minimize misunderstandings and reap amazing results. A better way awaits you in these pages. 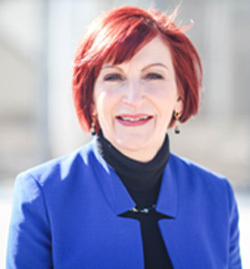 You will learn how to lead with an open mindset to ensure unparalleled results. Hey there! Already have the book and looking for the infographics offered in it? Get them HERE! I highly recommend this book for every executive who wants to make change real. Learn how to minimize misunderstandings and reap amazing results. A better way awaits you in these pages. You will learn how to lead with an open mindset to ensure unparalleled results. Do you live and work in environments with misunderstandings, miscommunication, and mistrust? Are you finding interactions with others challenging and a drain of your energy? Are you having impactful conversations with colleagues and others that inspire innovative and creative solutions, or do you feel like you’re just overwhelmed by the pace of work and life and the challenges of influencing others? What will help you be more successful in our fast-changing, diverse global world where the “rules” continue to change? Sometimes it’s difficult to believe there are any positive answers to these questions and issues. 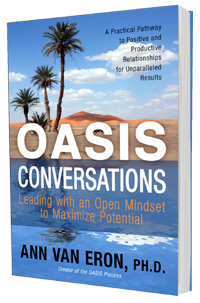 An OASIS Conversation is a powerful, five-step, easy-to-grasp process for creating a positive environment and communicating productively with others to produce agreements, solutions, and fulfillment. Each of the “moves” involves an internal awareness and choice of action. OASIS is also a metaphor. What would be possible if you could create the experience of an oasis in your interactions? What if you could turn the desert of miscommunication that exists between you and others into an oasis where you can meet and have a refreshing conversation—one that allows you each to understand where the other is coming from so you can develop empathy and insight and reach mutually beneficial agreements? 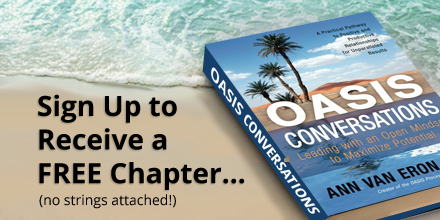 Get instant access to a FREE “Look Inside” of OASIS Conversations! Looking for the OASIS Process and/or Emotion Words Infographics? A brief bimonthly email with leadership tips. The more we are able to adapt an open mindset and practice the OASIS Moves, the more understanding among people there will be. And we need those conversations, insight and agreements more than ever in our complex, volatile environment. What is OASIS™ Moves Training? OASIS Moves is a signature training program that teaches skills and tools for effective conversations and having an open mindset. 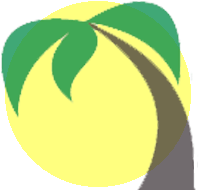 OASIS Moves provides a practical and memorable process that supports leaders, managers, professionals, teachers, parents and families in being open to different perspectives and to create positive and productive environments for unparalleled results. OASIS ® has been tested all over the world with much success. a powerful, five-step, easy to grasp process for communicating productively and respectfully. supports people in noticing their internal responses to others, manage those responses, become more open and create options and solutions. users not only in understanding emotional intelligence but provides a memorable system for being more emotionally intelligent that is based on brain research.